No ad on the back of the card. Note that our logo will still appear on the back. Includes an ad on the back of the card. The ad reads "Get more free Christmas printables at ChristmasOwl.com." No professional printing services. Can only be printed at home. 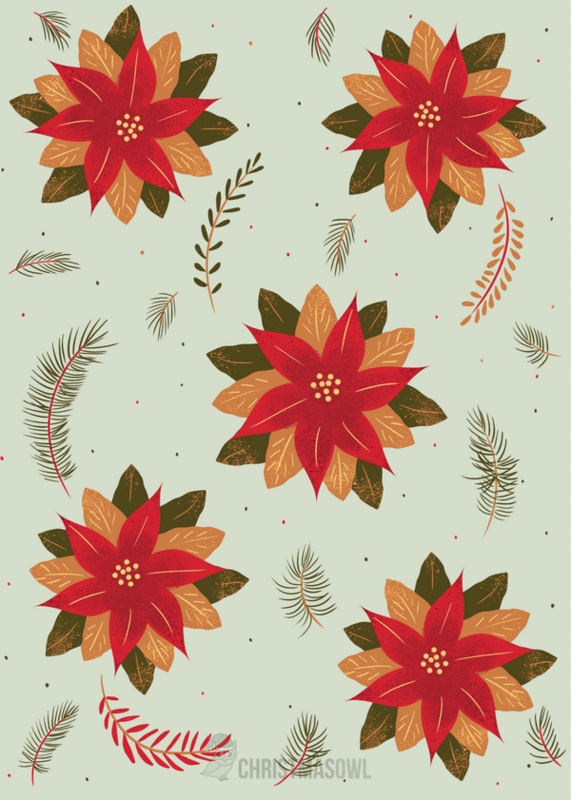 The cover of this card features poinsettia flowers with pine.The card measures 5 inches x 7 inches. It will fit in a standard A7 envelope. Download the PDF file. Open the file in Adobe Reader. Other PDF readers may work too, but you should try Adobe Reader if anything displays incorrectly. Print on 8.5 x 11 card stock for best results. Make sure you select "Actual Size" in the printer options to print at the correct size. Note that the wording for this option may vary depending on the software you use. If you don't see it, look for an option to disable scaling or set the size of the print. Fold the card along the lines marked fold. Score the paper first for better results. This can be done use a ruler and a bone folder, dull knife (e.g., a butter knife), or a scoring blade for your paper trimmer. Cut out the card with scissors or a paper trimmer. We recommend a paper trimmer for the best results. The card is 5 x 7, so you will need an A7 envelope if you want to use one. You may use the downloads for personal and classroom use. No commercial use of any kind. You may not sell or distribute our downloads. This applies to the works in their original format as well as any derivative works created with them. If you want to share our files with someone, please share the link to the page where the files are hosted rather than sharing the files themselves.